In 1969 I began studying landscape architecture at the Univesity of Edinburgh. That year saw the publication of Ian McHarg’s Design with Nature. McHarg gave a lecture at the university and one of our teachers (Michael Laurie) was a student and a great admirer of McHarg. Like many who join the landscape profession, I was hazy about its nature. Several recollections come to mind. I remember Michael asking us to produce ‘Master Plans’. ‘Wow’ I thought – because I was expecting to be more like a garden designer – ‘I’m going to become a master’, though I could not imagine what of. Then I remember being told we must ‘sell’ ourselves, which sounded more like being a mistress than a master. One of our teachers said that in ‘selling’ our designs, we must always mention ‘ecology’ and ‘the environment’. Another teacher told us that our professional body (now the Landscape Institute) was ‘half learned society and half trade union’ [he was wrong]. Looking back, I do not think any of this advice provides the strong grounding in ethics and ideas which a profession requires. The twentieth century was a great time for science, innovation and iconoclasm but a bad time for beliefs and ethics – possibly because so much was changing. In the twenty first century, there are public demands for the professions to have ethics: even bankers, journalists, politicians and police officers. I extend the demand to the environmental professions – including landscape architecture. But where can we look for inspiration? As discussed elsewhere, some religions are in difficult positions with regard to environmental ethics and, for a profession, it would be difficult to turn to a single ‘religion’ for an ethical base. And there are additional problems when adherents turn to ‘fundamentals’ which were established 2000 and more years ago. McHarg thought there was an anti-nature streak in Christianity and is thought to have borrowed this idea from Lynn White. White was a troubled Christian – and attracted to Buddhism because it seemed to be a more environmental faith. 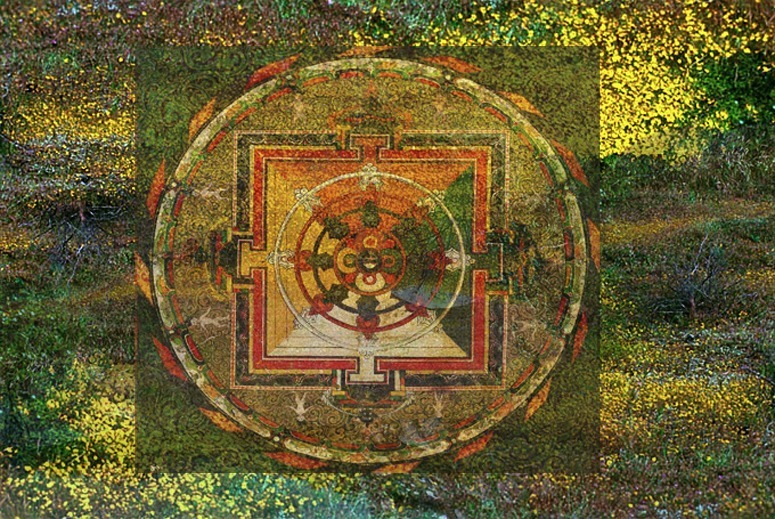 Buddhism dates from what Karl Jaspers called the Axial Age – as do the origins of the world’s other major philosophical and belief systems. That period seems to have had a talent for beliefs equaling our own priod’s talent in science, which may be a reason for looking so far back to find sound ethical principles. It is of interest that the medical profession dates from the Axial Age and has a good base in the Hippocratic Oath. I once had a go at adapting the Hippocratic Oath for landscape architecture. Nobody knows how many Chinese people are, to a greater or lesser extent, followers of Buddhist ideas. If the number is large, Buddhism could move up the rankings. My impression is that ‘communist China’ is now building more Buddhist temples than any country has ever built at any point in history. This entry was posted in Asian gardens and landscapes, Buddhist gardens and environmental ethics, Garden Design, Landscape Architecture on 22nd February 2013 by Tom Turner. 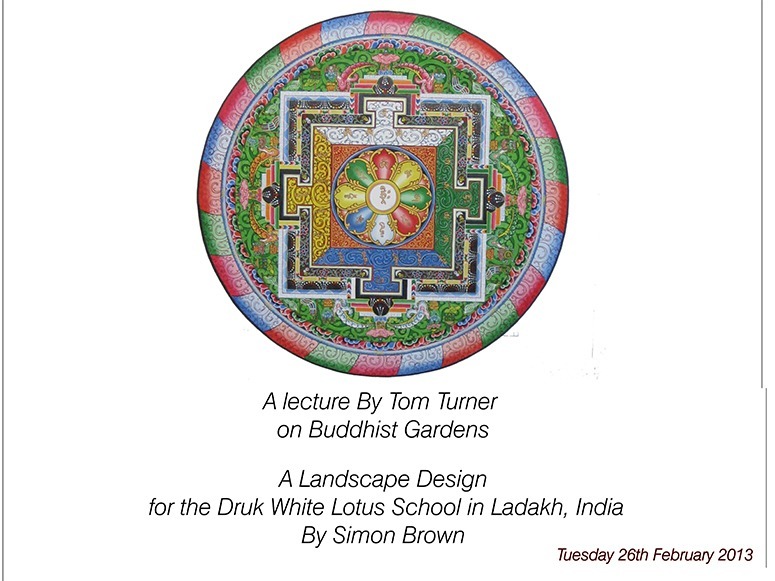 If anyone would like a (free) ticket, I am giving a lecture about the influence of Buddhism on garden design – to be followed with a lecture by Simon Drury-Brown on the design of the Dragon Garden for the Druk White Lotus School in Ladakh, India. Tickets are available from Eventbrite. The design of the school, by Arup Associates, is based on a mandala. The design of the garden extends the mandala concept and gives it a wider application. Classrooms face the morning sun to make the most of natural light and heat. The school is largely self-sufficient in energy. Two boreholes and solar pumps supply the school site with all the water it needs. This entry was posted in Asian gardens and landscapes, Buddhist gardens and environmental ethics, DWLS Dragon Garden at Druk White Lotus School, Garden Design, garden history on 9th February 2013 by Tom Turner.